경기 시흥시 시화멀티테크노밸리(MTV)에 위치한 제2캠퍼스는 부지 8만8,000㎡ 가운데 1만4,800㎡에 연면적 1만1,700㎡ 지하 1층 지상 7층 건물의 교육ㆍ연구시설로 재직자 교육과 기술사업화에 중점을 둔 기업인재대학과 브릿지랩연구소를 중심으로 운영할 예정이다. 기업인재대학은 일ㆍ학습 병행제 사업과 재직자 교육 등을 통해 기술 혁신에 어려움을 겪고 있는 중소ㆍ중견기업에 우수 인력을 공급하는 역할을 맡는다. 대학부설 연구소인 브릿지랩은 연구개발과 기술사업화를 통해 대학 경쟁력 향상을 꾀하고 기업에 새로운 기술을 제공하는 역할을 하게 된다. 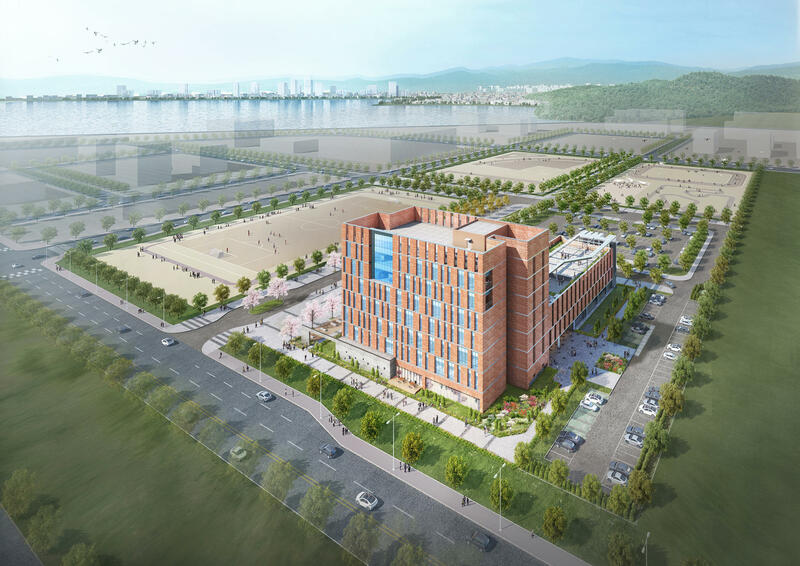 The Korea Polytechnic University KPU 2nd Campus is located in Sihwa Multi Techno-Valley(MTV) in Siheung city. In the 88,000㎡ site, the total area of the architecture accounts for 11,700㎡ with 7 storeys and one basement floor. As a research and education facility, the campus will place its focus on raising new corporate leaders in the basis of technology business models in the Bridge Research Lab and Corporate Leader University. The Corporate Leader University offers education and hands-on experience in businesses to their students and thus, raises talented work forces who could work for small and medium sized businesses which are desperately in need of technological innovation. The Bridge Research Lab which is an affiliate of the university develops technologies and make lucrative business models, providing new technologies to the corporates and improving their competitiveness in the markets.